Check out our Media Page for the latest news and announcements regarding the MLPA. The Mirror Lake Protective Association (“MLPA”) is a non profit tax-exempt 501(c)(3) corporation formed in 1991 to help maintain and preserve the environmental quality of Mirror Lake, a 378-acre lake located in the towns of Wolfeboro and Tuftonboro in Carroll County, New Hampshire. Why was the MLPA Established? The MLPA is involved with a number of activities, including participation in the University of New Hampshire Center for Freshwater Biology’s New Hampshire Lakes Lay Monitoring Program, the New Hampshire Department of Environmental Service’s Volunteer Assessment Program and the state-sponsored Lake Host Program and Weed Watcher Program. In addition, the MLPA supports, through charitable donations, the New Hampshire Lakes Association, the Lakes Region Conservation Trust, the Loon Preservation Committee, and Friends of Libby Museum. The annual operating budget of the MLPA is funded by the annual membership contributions of its members and special donations and grants. The Town of Tuftonboro contributes to the cost of the laboratory analysis of water samples collected by volunteers under the UNH Lay Lakes Monitoring Program. A comprehensive analysis and evaluation of Mirror Lake’s water quality was undertaken in 2011/12 [click image to right to view]. Various remediation and preventative actions, recommended by the Plan, are continuous and are carried out by volunteers, professionals and the Towns of Tuftonboro and Wolfeboro. 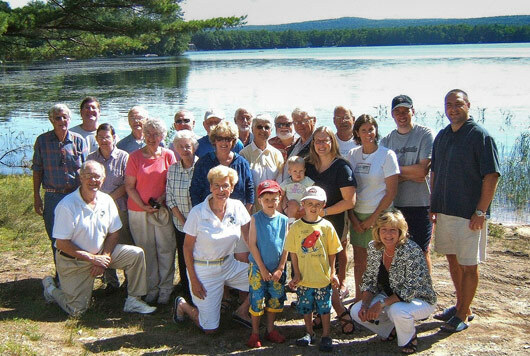 The MLPA relies on active volunteers to maintain and care for Mirror Lake and its watershed. Described below are MLPA’s various volunteer programs carried out by community members. If you interested in participating or have any questions please feel free to contact us at anytime. Mirror Lake’s water is sampled, twice monthly, April through October, at five locations in the lake. Monthly water samples are taken at four locations in the tributary entering Mirror Lake at Lang Pond Road. Samples of lake sediment and soil are also taken. Monitors collect samples, process them and deliver the samples and data to the water quality testing labs at UNH. Weed Watchers monitor the shoreline and lake bottom for aquatic plants and report their findings to the MLPA. Monitoring is done using boats, including canoes and kayaks. 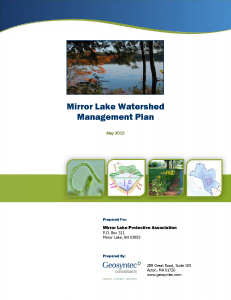 A 2010 Field Guide to the Aquatics Plants of Mirror Lake has been prepared by MLPA’s environmental advisors. Mirror Lake has 23 species of aquatic plants and no invasive plants. The Guide, with colored pictures and a detailed description of each plant is available from MLPA. Volunteers check water craft for milfoil and invasive weeds at the Route 109 boat launch to prevent invasive plants from being introduced into Mirror Lake from other lakes. Our stakeholder data bank is housed on a secured data storage service offered by GoogleÒwhich is maintained and backed up systematically by volunteers. Volunteers also assist with stakeholder mailings and other stakeholder activities. Volunteers help maintain this web site and MLPA’s facebook page. The Education Committee develops programs for public outreach and educational activities which target watershed residents. Activities may include webinars, blogs, fundraising, awareness events and information centers, with the content of each concentrating on lake environmental issues. Officers are elected annually and board members serve for a term of three years. Elections are held in the last weekend in June at the annual meeting. How Can I Join the MLPA? Please fill out the online form on the Membership & Support page. All contributions are tax deductible, to the extent permitted by law.